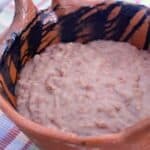 Homemade Refried Beans made with just five-ingredients is an easy recipe that includes peace of mind knowing that your kids are getting a healthier version made with real ingredients. If you love easy, homemade Mexican food, you might love Authentic Mexican Rice, cheese enchiladas, and Tres Leches Cake! 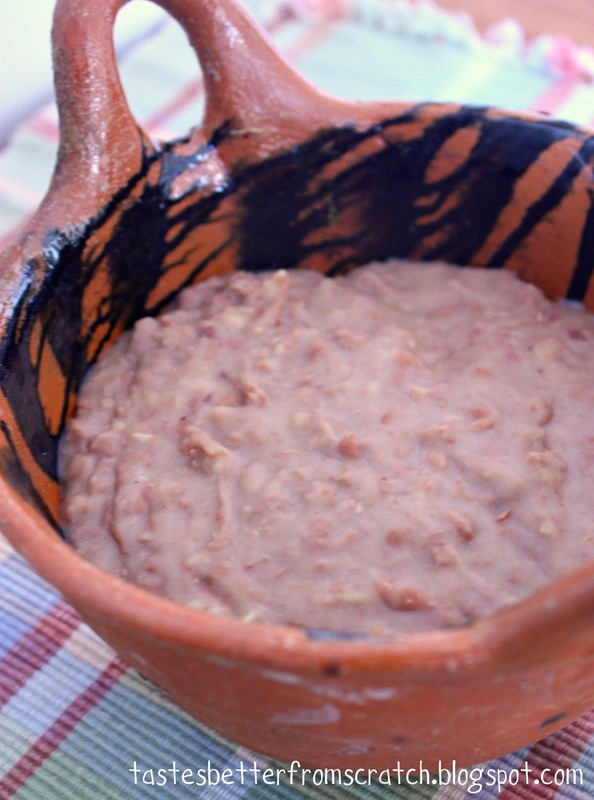 It wasn‘t until I spent a few months in Puebla, Mexico that I learned how easy homemade refried beans were. They do require you to soak them overnight, and cook them for one hour, but if you have the time, there is really nothing to it and no equal to their taste! I cringe at the thought of ever eating canned refried beans again when I know what these taste like! If I’m in a hurry, I love our Semi-Homemade Refried Beans recipe! Find it here. Homemade Refried Beans are made with just five-ingredients and are easier and healthier than the store bought version. Everything's better from scratch! Soak the beans overnight in a large bowl of water. Drain soaked beans and place them in a pot. Add fresh water to cover the beans up to two inches above them. Add onion to the pot and a couple dashes of salt. Bring beans to a boil, cover and simmer for one hour, stirring occasionally. Check the beans and if they’re not completely cooked after one hour, let them simmer a few minutes longer until they’re done. Remove the onion chunks and drain the beans, reserving 1/2 cup of the bean broth water. Add the garlic and cook, stirring constantly, for one minute. Add the drained cooked beans and 1/4 cup of the bean broth. Smash the beans with a potato masher or the back of a spoon. Continue stirring and mashing until you get the texture you like and the beans are the consistency of soft mashed potatoes. Add more bean broth liquid if necessary. Season with salt to taste. I made this recipe today. Since I am now on a low-sodium diet, canned beans are in my rear-view mirror. I did make some adjustments to the recipe for added flavor. I added 1/2 tsp salt during the cooking stage. I chopped the onion before adding it to the cooking pot with the beans and then left it in to be “smooshed” with the beans in the frying pan. I added 1/4 tsp. of cumin and a pinch of cayenne in the smooshing stage too. After tasting the finished beans, I decided to add 1/2 tsp. salt and a tsp. of white wine vinegar. The total sodium count is 2300 mg. But there are at least 10 servings from this batch so the amount of sodium per 1/2 cup serving is 230 mg, a far cry from the 540 mg in canned refried beans! I am very pleased with the results and am looking forward to using them on our tacos .